Dinner at Antoine’s – Rated 5 Stars! On a mild Saturday evening in April, over 150 guests strolled up a path lined with shutters and Spanish moss to the tune of “When the Saints Come Marching In,” performed by our very own two-man jazz band featuring Teddy Leamon on trumpet and Campbell Gray on sax. Upon entering the Library for the 10th annual Mystery Dinner, patrons were welcomed to Antoine’s Restaurant in the French Quarter of New Orleans circa 1948, inspired by Frances Parkinson Keyes’s bestselling novel Dinner at Antoine’s. Our 9th annual Mystery Dinner was a huge success! On April 22 approximately 145 ticket-holders arrived at 6 pm to find the Library decorated around the theme of Henry David Thoreau’s Walden. Drinks and hors d’oeuvres were served and guests departed at 7 to their appointed homes for dinner. 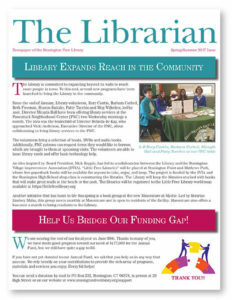 Financially, the event was a success with over $13,000 in ticket sales and over $5,000 towards new laptops and an expanded new book area for the Library.